Looking for in ground basketball system? BuiltRiteBleachers.com offers competitive pricing on Brute Flight Get a quote today! First Team's BRUTE fixed height basketball goal systems are a step ahead of the rest when it comes to playground rigidity, performance and durability! The Brute series of basketball goal packages are built with a stable 5 9/16" diameter galvanized post. The post extension allows for 72" of run-out room and is designed with First Team's unique nosecone style backboard mounting making basketball backboard installation and setup a breeze. The Brute is built to take whatever punishment comes it's way and is fully covered by First Team's exclusive LIFETIME UNCONDITIONAL WARRANTY! For added safety, pole padding and backboard padding are available for any Brute basketball package. So don't get bullied into purchasing inferior units. 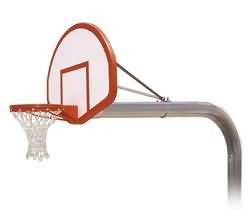 Give your playground court added toughness and performance season after season with the BRUTE Fixed Height Basketball Goal! Approx. Shipping Weight: 422 lbs.